19mm Sway Bar by Texas Speed Werks The TSW rear sway bar features three adjustment holes and giant urethane bushings with a grease channel to hold the grease and keep it quiet. It also has grease zerk fittings on the bushing brackets to allow you to regrease the sway bar without removing it. 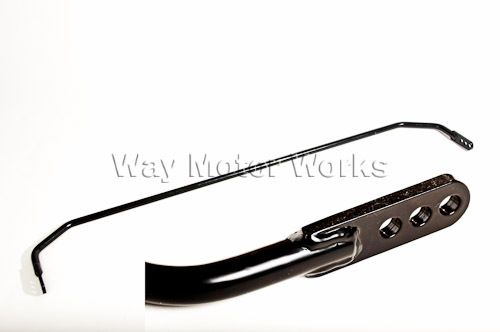 The sway bar is powder coated in a super high quality gloss black. Made in the USA! This TSW bar is outstanding. Well-made and solid. Takes the handling to a whole new level. My first and favorite mod. If you don't do anything else to your MINI, get one of these! The TSW bar went into my Clubman this afternoon and it's night and day vs the stock. I'm on the middle setting and for street it feels great -- hugely less body roll in corners, but not too harsh going over those bumpy, frost-rippled back roads so characteristic of New England. 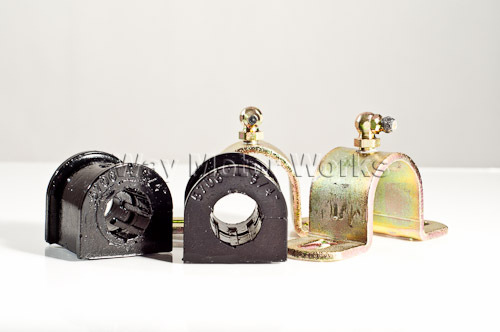 The TSW RSB is very well made, with careful welds and good finishing. Love the eurethane bushings and far stouter-than-stock brackets. There was even a tube of lube for the brackets included. Overall, it's a well-designed product for a well-designed car. Love it!